Thank you to everyone who came to the Purim Party at Magain David on March 15, ﻿2014. The Purim party and treats were sponsored by Leyla and Eugene Knafelman. 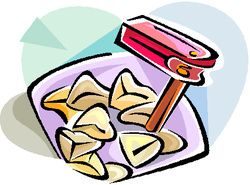 Hamentashen were donated by Dina Man of Dina's Catering. Face painting and activities for children were sponsored by Angela Beniflah. Please support our activities and donate here.